23-Mar-2008 -- The story starts from 41°N 23°E. This is the third out of a series of four confluences that we visited on a 5-day trip through Northern Greece, Macedonia and Albania during the Easter Holidays. In the morning we started our approach to the confluence from the capital city Skopje, which is about 40km due east of the confluence. The unique thing about this confluence is that the motorway M4 between Skopje and Tetovo directly passes over the point. This was probably the quickest out of 160 confluence visits! We left the motorway one exit prior to Tetovo with a distance of 6 km beeline left. A county road parallel to the motorway brought us directly to our target. We stopped our vehicle at the road’s nearest proximity – 62 m beeline. From the confluence the Šar Planina mountain range can be seen with its highest peak Mount Korab (2748 m). At this time of the year, the peak is completely covered with snow. The sun was bright and thus the panorama of the confluence appeared to be pretty. Actually, there are two dump yards for old vehicles just 30m from the confluence point. Old car parts are lying around. 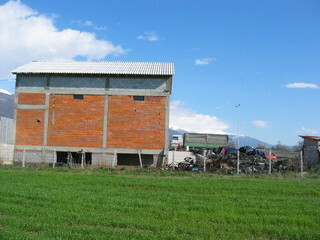 There is a new not plastered building 20m to the North. A ditch separates the field with the confluence from the auto service company and the road. I did not have a picture of the GPS unit this time. There is a long story behind this – detailed in the write-up of the next confluence point. All I say here is that we lost a camera – including the memory card including the pictures. We continued our trip to the border point in Debra and entered Albania. It was a long drive over potholed mountain roads until we reached the capital city Tirana in the evening, where we stayed the night. Topography: flatland, flood-plane, in all directions mountains can be seen. Vegetation: grain field with young sprouts. Description of the CP: In Macedonia’s highlands, on the flood-plane of Vardar river. Šar Planina mountain range to the North and West. Direct location in the corner of a crops field, which is separated from the road and highway by a ditch and junk yards. Story finishes at 41N 20E.